Originally founded by the Romans before the birth of Christ as a provincial outpost, by the dawn of the fourteenth century the city of London had grown to a population of between 50,000 to 80,000. It had become a teeming commercial and manufacturing center and enjoyed a high level of prosperity. The Thames River beside which it sat provided a liquid highway to the markets of Europe. If we had the abilty to travel back in time, the first thing that would attract our attention upon entering the city would be the putrid smell permeating the atmosphere – a by-product of the many tanneries and breweries that lined its close-packed streets combined with the natural odors exuded by a population for whom bathing was at best an annual event. Nearby, the up-river village of Westminster was establishing itself as the seat of royal power and the residence of the King. 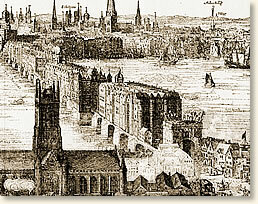 The royal presence within London was exercised through the office of the Sheriff who acted as the King’s representative. A few years earlier, London had won from the Crown the privilege of selecting its own Sheriff in return for an annual payment of 300 pounds. "The said Reymund struck her with his foot under the navel. . . "
"On Monday the Eve of All Saints [November 1] the year aforesaid [A.D. 1300] information given to the aforesaid Coroner and Sheriffs that a certain Cristina Morel lay dead of a death other than her rightful death in the house of her said husband which he hired of Thomas Romeyn, in the Parish of St. Mary de Aldermaiichirche, in the Ward of Cordwanerstrete. Thereupon they proceeded thither and having summoned good men of the said Ward and of the three nearest Wards � viz. : Bredstrete, Vintry and Qucennhithe - they diligently examined how it happened. They say on their oath, that when on the Friday preceding, in the dusk of the evening, a certain Reymund Bernard 'Dorette' and a certain Peter de Artoys were together and passing the hostel of the said William, the said Reymund, entering the house, found the said William in the solar and charged him with having feloniously sold a certain coat belonging to the said Reymund. There arose a dispute between them and the said Reymund attacked the said William, and the said Cristina interposing. The said Reymund struck her with his foot under the navel so that she fell. She lingered until the following Sunday, when she died, at the hour of Prime, [Six o�clock in the morning] of the said kick. Being asked if the said Peter aided and abetted, they say No, but when the said Reymund entered the house Peter went home. Being asked who were present they say nobody except Reymund. Being asked what became of Reymund after the felony, they say that he forthwith went to the hostel where he and the said Peter were staying, and as soon as he became aware of the death of the said Cristina, of which he was advised by a certain Magot his mistress, he immediately took flight and the said Magot likewise, but whither, they know not. The said Peter was attached and brought to the house of Luke de 'Averngge', the Sheriff. Being asked if they suspected anyone else of the said death besides the said Reymund, they say No. The corpse was viewed, and the belly appeared blue and inflamed under the navel. Precept to the Sheriffs to attach the said Reymund as soon as he be found in their bailiwick. The chattels of the said Reymund and Magot were appraised at 30 shillings for which Luke de Haveryngge, the Sherriff, will answer. This eyewitness account appears in: Sharpe, Reginald R., Calendar od Coroners Rolls of the City of London, A.D. 1300-1378; Douglas-Irvine, Helen, History of London (1912); Porter, Roy, London: a social history (1995). 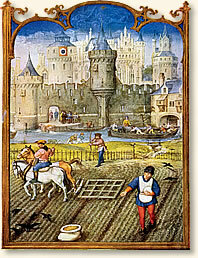 "A Medieval Murder, 1300", EyeWitness to History, www.eyewitnesstohistory.com (2010).